— Caleb and Hane have been matched through Big Brothers Big Sisters of Central Carolinas since 2014 when Caleb was seven years old. Caleb and Hane have been matched in the Big Brothers Big Sisters since 2014 when Caleb was seven years old. Without a father actively involved in his life, Caleb’s grandparents enrolled him in the program to give him exposure to a positive male role model. They quickly established a strong bond. Regular time spent together in everything from trips to the park, to visits to the bookstore and Hane’s office in the Bank of America Corporate Center, Hane is a consistent presence in Caleb’s life. That consistency proved especially valuable in 2017 when Caleb’s mother suddenly died and his grandparents assumed the role of his parents. During this difficult time, Hane helped provide stability and opportunity for Caleb. In conjunction with Caleb’s grandparents, Hane reached out to his contacts to provide grief support for Caleb. 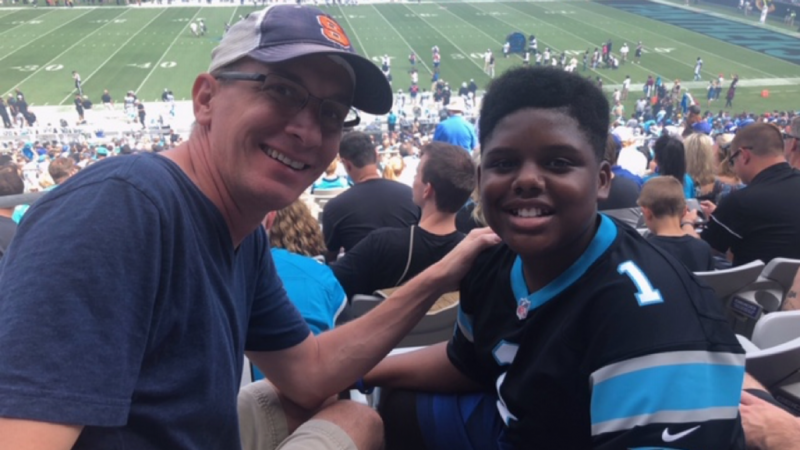 He also communicated with Caleb’s teachers and school administration to ensure Caleb would get the support needed to continue to succeed at school after his loss. Thanks to his friendship with the director of a local nonprofit, Hane helped Caleb enroll in a multi-year summer camp program. Attending just weeks after his mom’s death, it was a welcome opportunity for Caleb to learn valuable life skills, make new friends and just be a kid. Hane helped Caleb and his grandparents navigate through their difficult time of loss. He used his contacts in the legal field to help Caleb’s grandparents establish formal custody of Caleb. He helped Caleb find the right place where he could process his grief. Shortly after his mom’s death, Hane enabled Caleb’s participation at an overnight summer camp through his friendship with the camps’ founder. Caleb built new friendships, learned valuable life skills and developed independence during his time away. He looks forward to going there every summer. Hane also helped Caleb follow his passion for music. An avid drummer, Caleb only had a chance to play at the local music store. Hane secured a drum set for him so he could play to his heart’s content at home. When Caleb missed the sign-up to join his middle school band, Hane contacted the band director to schedule a personal meeting and helped secure a spot for Caleb in the program. Caleb now is a proud member of his middle school band … playing the tuba! Today, Caleb is doing well in school, enjoying his time behind the tuba, and playing football and basketball. Hane, who has three children of his own, is committed to continuing to be Caleb’s Big Brother and helping him achieve success in life. Big Brothers Big Sisters of Central Carolinas helps children in our region reach their full potential by providing mentors for children. They serve more than 1,500 children in Mecklenburg, Cabarrus and York counties, through traditional community and school-based mentoring as well as innovative specialty programs like Students Understanding College and Careers through Education, Skills and Support (SUCCESS), a new program for Littles in grades 8-12 and their Bigs. SUCCESS gives these matches monthly opportunities and experiences focusing on topics such as SAT prep, finding the right college, resume building and interviewing skills. that connect caring adults with local children in meaningful one-to-one relationships.